In Skyhill, you find yourself stuck in your luxury suite on the top floor of a high-rise hotel building as an unknown disaster strikes the city. After a long while of wondering what on Earth is going on, you find yourself trying the phones and everything else you could think of, but they’re either not working or no one is there. The whole time your food supplies are dwindling. Eventually, you must leave your room: Your only other option is a slow, terrible death by starvation. Your room is 100 floors up, and the elevators are not working. Can you make your way through all 100 mutant-infested floors to reach the ground level and escape? 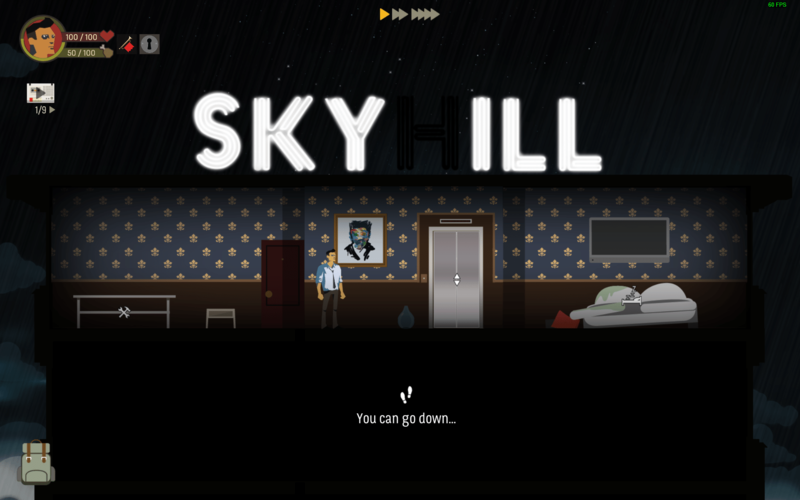 Skyhill is a point and click adventure game. You simply click on a room to make your character go there, or click on certain objects to interact with them. Skyhill also has heavy rogue-like elements: death means starting over anew. There are a plethora of items to be found in the hotel’s many rooms, from a myriad of different foods to a bunch of other items that can be used in crafting or as weapons. Each time you start a new run in Skyhill, you can choose from one of the game’s four difficulty levels. Then you get to choose two perks to use in this run (one passive and one active). The top row contains passive perks and the bottom row contains active perks. When you start the game for the first time, none of the perks will be unlocked. The first pair unlocks when you enter the 99th floor, the second pair when you make it down to the 89th floor, the third pair unlocks when you make it to the 79th floor, and so on. The passive perk you choose from the top row is active at all times. The active perk you choose from the second row is manually activated by clicking on its icon by your health bar. In the image below, I have the lock picking active perk that allows you to unlock doors without a key. However, these active perks generally have cool down times, meaning you need to put some careful thought into when you choose to use them since they won’t be available again for a long while. 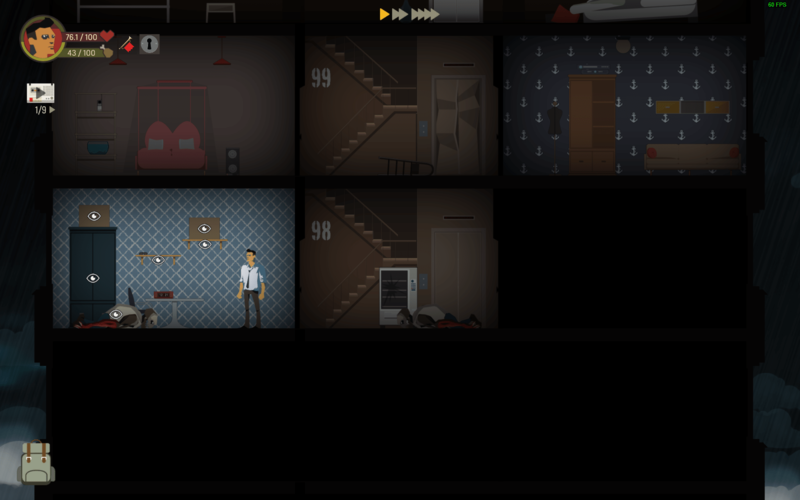 Skyhill also changes things up every time you start a new run, as the tower is randomly generated each time, as every room’s type is random, and so are the types and number of loot-able objects in the room. The locations and types of monsters are also random, although the harder monsters will always appear on lower floors. So you won’t be finding yourself up against one of the hardest monsters on one of the earliest floors. That’d be pretty evil, don’t you think? You can also change the game speed via the three triangle icons in the top center of the screen. Speeding up the game time will make your character walk faster, along with the combat animations and such. Your nice luxury suite in Skyhill isn’t just your starting point. It serves a more important purpose in your bid to reach freedom, as it acts as your base of operations (you cannot setup bases elsewhere). You can upgrade the door to reduce the chances of bad things happening while you sleep, the kitchen to unlock new and better food recipes, the workbench to unlock new weapons crafting recipes, and your bed to increase its healing rate. Resting costs you hunger points, though. Upgrading these will be tricky as doing so requires materials, some of which are hard to come by. You will also find documents and audio tapes as you play the game. The documents and audio tapes you find carry over from one run to the next since there are a lot of them. There are also some random side quests that pop up too. 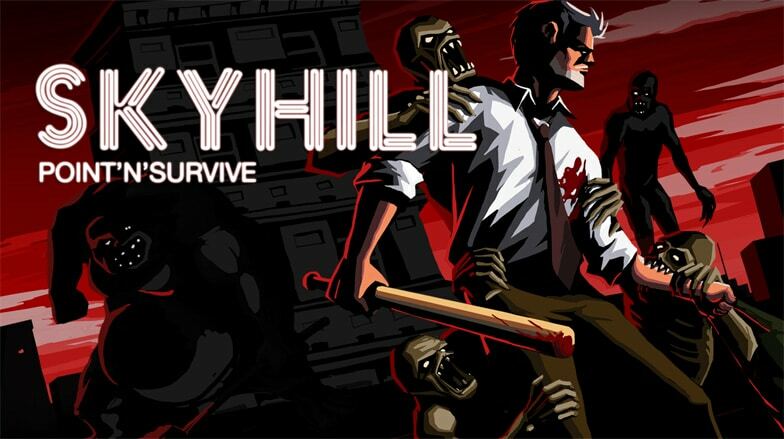 The bulk of your time in Skyhill will be spent looting rooms and fighting mutants. Each time you move from one room to another, you lose one hunger point (or 2 HP if you’re out of hunger points). The eye icons in the screenshot below denote objects you can search. The game has an option to toggle these so you can turn them off to make things slightly more realistic and possibly slightly harder. You can also see in this picture that the fallen body of the monster that I defeated in this room is also loot-able. Unfortunately, there will be many times when you loot things and find out they are empty! Sometimes a room will not have any lootable objects in it at all. You will also encounter some rooms that are locked and can only be entered if you have a key (or the previously mentioned lock picking perk). Your character has four major stats that you can upgrade as you level up. Normally, each level up nets you four skill points that you can put into your stats in any way you want (one of the perks mixes this up though). How you build out your stats is important as every weapon has certain stat requirements. You can still use a weapon even if you don’t meet these requirements, but you’ll be much less effective since the weapon will have a penalty on it until you have the skills to use it effectively. So it might say “-33%” in red by it, for example. The image below shows your inventory screen where your stats are shown. You can access it by clicking on your rather sad looking backpack icon in the lower left corner of the screen. It shows stuff like your progress towards the next level up, as well as HP and hunger. Food items can be eaten to refill hunger, but they can also be used to craft better food items depending on how upgraded your kitchen is. Sometimes you’ll find overripe foods which give less hunger and also risk poisoning you (which will cost you 5HP). The Journal pane lists all the documents you’ve found so far across all runs, and the right pane is your crafting pane. Most items must be crafted in your suite, though, so that you can use the workbench. Only five weapons are available for crafting at first (as you can see below), but more unlock each time you upgrade your workbench in your luxury suite. You may also have noticed that in the image above, there is a blue arrow that has appeared under my character portrait. That blue arrow indicates that you have new skill points available to spend to improve your character’s stats. When you have new skill points, just click the green plus icon beside a stat in the inventory screen to add a point to that stat. 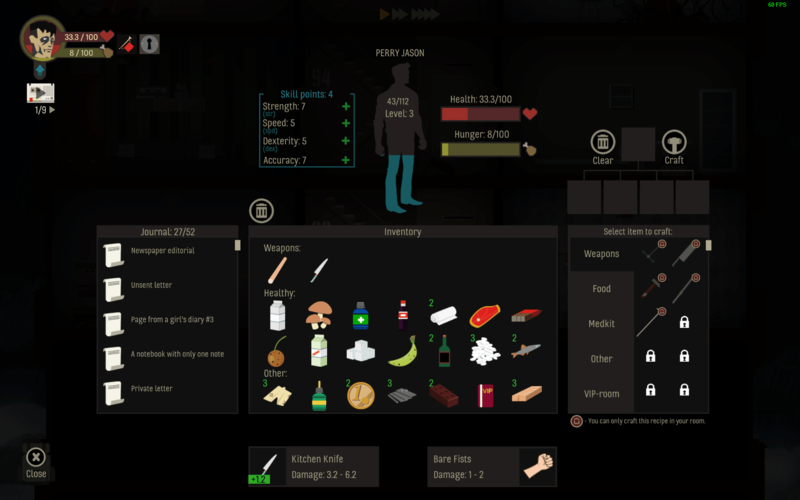 Anyway, now that we’ve looked at your character stats in Skyhill, we can check out the combat system. It is a turn-based system. Early on you have no weapons except for your own fists. They work but they aren’t very effective at dealing damage. In the early floors in Skyhill, you can just click on your foe to attack it, but this will become less effective as you encounter stronger and more dangerous mutants.